With Super Bowl week officially underway in Atlanta, here’s a look at the matchup between the New England Patriots and Los Angeles Rams by the numbers. 0: Quarterbacks who have played in a Super Bowl at an older age than Tom Brady (41). 1: Teams that have won more than five Super Bowls (Pittsburgh Steelers). The Patriots can join them at the top with a sixth title on Sunday. 2: Teams that have lost five or more Super Bowls. A New England loss on Sunday would make the Patriots the only team in NFL history with six Super Bowl defeats. 2.18: That’s Brady’s average release time on throws this postseason. No quarterback throw the ball in fewer than 2.47 seconds, on average, during the regular season. 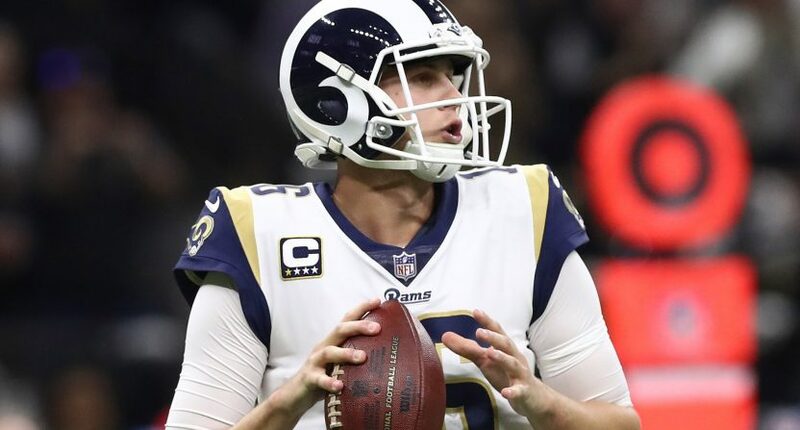 3: Quarterbacks who have played in a Super Bowl at a younger age than Rams quarterback Jared Goff (24). Brady was also 24 when he played in his first Super Bowl, but he was a couple months older than Goff is now. 4: Total point differential for all eight of New England’s 21st-century Super Bowl appearances. Their largest win came by six points in overtime, while their largest loss came by eight points last year against the Philadelphia Eagles. 5: Total number of Super Bowls in which Rams players have participated. C.J. Anderson has played in two, while Aqib Talib, Brandin Cooks, and Sam Shields have played in one each. 6: Teams, aside from the Patriots and Rams, that committed fewer than 100 accepted penalties this season. 7: Teams — including the Rams — that pulled off four or more fourth-quarter comebacks this season. The Patriots had just one. 8: Total number of Super Bowls in which Brady has played. That’s obviously a record. 9: Jared Goff’s age when Brady won his second Super Bowl, back in the 2003 season. 10: Super Bowls decided by one score in the last 15 years. That’s equal to the amount of 10-score Super Bowls from the previous 37 years. I think that's probably a huge reason the NFL has gained so much popularity the last couple decades. 11: Total number of Super Bowls in which Bill Belichick has coached. Also obviously a record. 12: Teams that have won more than one Super Bowl. The Rams can join that club with a win, but it’d be their first title in the city of Los Angeles. 17: Years (to the day on Sunday) since the Patriots and Rams met in Brady’s first Super Bowl. This’ll be the eighth Super Bowl rematch in NFL history. 21: Touchdowns scored this season by Rams running back Todd Gurley, who led the league in that category. 32: That’s where the Rams ranked in terms of rushing yards allowed per carry during the regular season — far from ideal considering how strong the Patriots’ power-running game has become. 33: Age of Rams head coach Sean McVay. He’s the youngest head coach in Super Bowl history. 35: Years since a Los Angeles-based team last won a Super Bowl (the Raiders beat the Washington Redskins 38-9 in January of 1984). 66: Belichick’s age. With a Super Bowl win, he’d be the oldest Lombardi Trophy-winning head coach in NFL history. 90: Passes thrown without a single sack by Tom Brady these playoffs. 106: Receptions thus far this year by Patriots catch-happy running back James White, who makes life a lot easier for Brady. 154: Total pressured racked up by Rams defensive tackles Aaron Donald and Ndamukong Suh this season. And Suh has picked up steam of late. If indeed the key to beating Brady is natural pressure up the middle, this might not be a good matchup for the Patriots.